SecuriWORLD is revolutionary in the field of security and has become the leading security company in the security guard industry. SecuriWORLD Canada offers the widest variety of Security Services from High-Profile Concierge Clerks to Law-Enforcement in High-Crime Rate areas to Large-Scale Events. SecuriWORLD gives you the freedom you need to move forward. The superior quality of our security guards, concierge and other specialized security solutions have earned us our solid place on top of the security industry. We guarantee you a renewed state of being protected. SecuriWORLD is the solution for progressive organizations who are ready to move forward. By partnering with SecuriWORLD Security, you will finally be free to focus your time on what really matters to you. Do you wish you could improve your existing security services plan but your current provider is outdated and unable to adapt? SecuriWORLD offers you far more flexibility and lower fees than other security companies, You are entitled to choose what's best for your business. Superior customer service is just one of the benefits you gain from SecuriWORLD. Switching to is fast and easy. Our Security Specialist are experienced in assisting Stratas, Shopping Malls, Corporations and Government Organizations to improve security security measures while saving money. Our most popular cost-saving solution is Mobile Patrol Checks for just $9.99 each. Find out why so many clients transferred their security services to SecuriWORLD. SecuriWORLD is one stop solution for all your Security needs. DO I NEED TO HIRE A SECURITY GUARD? most trusted name in the Vancouver security industry. 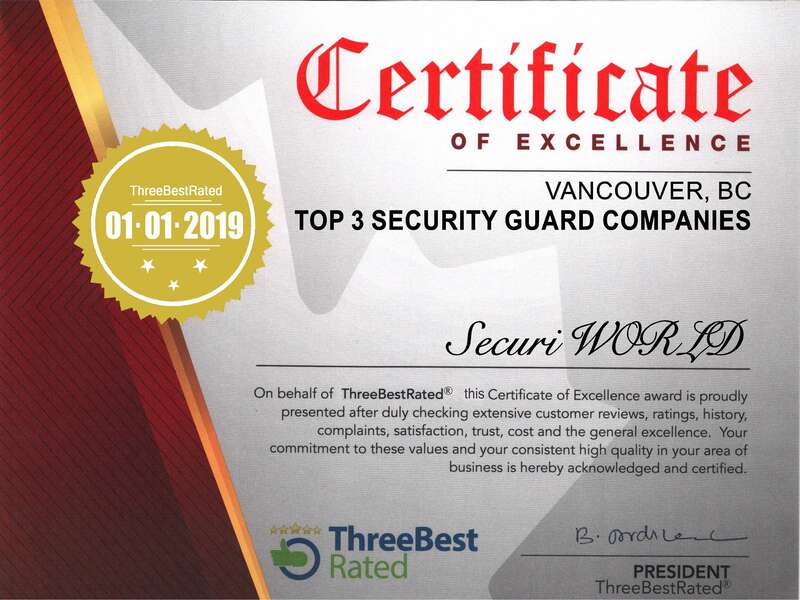 The superior quality of our Security Guards, $9.99 Mobile Security, and other Specialized Security Solutions have earned us our solid place on top of the Vancouver Security market.